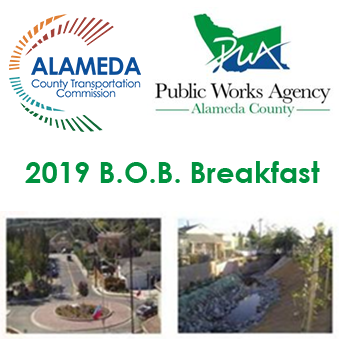 On Friday, January 25, 2019, Alameda CTC participated in Alameda County Public Works Agency’s (ACPWA) Building Opportunities for Business (BOB) Breakfast Kick-off! This was the first of a series of informational meetings targeting local businesses interested in working with various Alameda County firms and agencies. This was an opportunity to network with other firms and agency representatives who presented information on upcoming work, project details and contracting opportunities for small, local and/or emerging businesses, as well as disadvantaged, minority and/or women contractors. For businesses that wish to be certified under Alameda CTC’s LBCE Program, please visit our Contracting Opportunities page or contact certification@alamedactc.org for more information. Meeting Time: 8:30 a.m. – 10:30 a.m.